The battle pitting The Undisputed Era against NXT North American champion Ricochet, United Kingdom champion Pete Dunne and The War Raiders headlined another explosive live event special on WWE Network. Matt Riddle defeated Kassius Ohno. 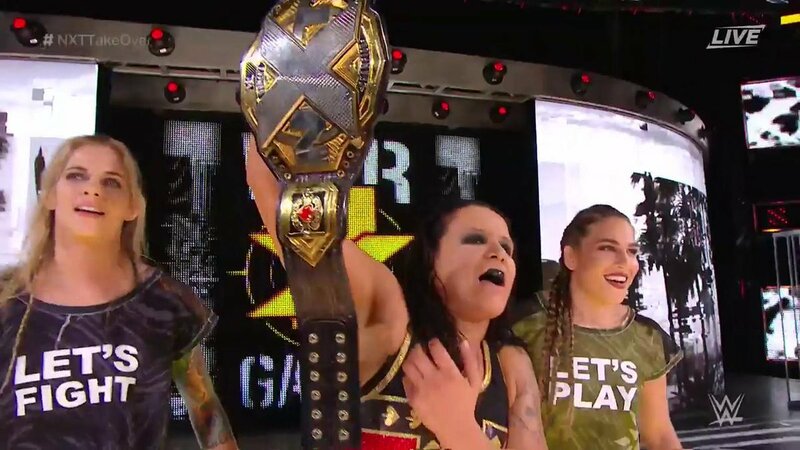 Best 2-out-of-3 Falls for the NXT Women’s Title: Shayna Baszler defeated Kairi Sane 2-1. As The Queen of Spades diverted the referee’s attention by selling an injury to her teeth, Jessamyn Duke and Marina Shafir interfered, attacking Sane. Baszler choked her out to score the victory in the first fall. Duke and Shafir continued to interfere in the third fall until Dakota Kai and Io Shirai hit the ring, making the save and wiping out the Horsewomen at ringside. Sane delivered the Insane Elbow, but Baszler countered into a roll-up and successfully retained her title. Aleister Black defeated Johnny Gargano. The action continued at an electric pace, with hard-hitting strikes defining the match. Late in the match, Gargano pushed Black to the outside. He followed with a tope suicida, but Black got his knees up, leaving his opponent reeling. Back in the ring, Gargano begged Black to finish him off. When the former NXT champion tried, Gargano dodged Black Mass and rolled him into the Gargano Escape. Black fought out and delivered a spinning knee. He added a second without a knee pad and finished a stunned Gargano off with consecutive Black Masses. NXT Championship Match: Ciampa defeated Dream. At one point, Ciampa scored a roll-up and appeared to win the match, but a handful of tights caused the referee to call off his count. This opened up Ciampa for a big superkick from Dream, who scored a red-hot near-fall that popped the crowd. Ciampa responded, delivering Project Ciampa. He was still unable to keep his opponent down. Frustrated, Ciampa brought his title into the match, but the referee pulled it away. Dream rolled him up for two and followed up with a DDT onto the belt. Ciampa exposed part of the concrete floor at ringside and, after going over the announce table with Dream. He tried for another from the ring apron but crashed to the floor. His elbow wracked with pain, he fell prey to a DDT on the metal partition between the two rings. WarGames: Ricochet, Pete Dunne and War Raiders defeated Undisputed Era. The WarGames main event started with Ricochet and Adam Cole resuming their rivalry, the North American champion and the leader of Undisputed Era beating each other around the two rings and two steel cages. Kyle O’Reilly who joined the fray, grounding Ricochet and pounding away with open-palm strikes. O’Reilly and Cole, former Ring of Honor tag team champions, paired off on Ricochet until Hanson entered to even the odds. Cole and O’Reilly created just enough separation to allow Roderick Strong to enter next and unload on both Ricochet and Hanson. Their dominance came to an end with the arrival of Rowe. Bobby Fish was the last Superstar to enter for Undisputed Era, but before he did, he injured the shoulder of Pete Dunne and locked him in the cage with another, unofficial lock and threw away the key. Referees found bolt cutters and unlocked the cage, springing the badass Dunne on his opponents. After a brutal seven star match, All eight Superstars rose to their feet, the teams coming face-to-face as chants of “NXT” rang out. Cole followed up with the Last Shot to Dunne and nearly won, but Dunne answered with the Bitter End. Ricochet followed seconds later with another big splash, and the babyfaces finally secured the win.